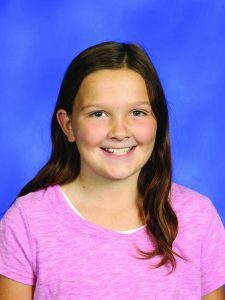 Sophia Howell-Hummel, 6th Grade, is in the Community and Service magnet at East and attended Lakes for her elementary school years. She is the daughter of Tanya Howell and Benjamin Hummel. She has four siblings: Trenton, Hannah, Olivia and Simon. The family has many pets which include their two dogs: Winston and Estabon, two rabbits: Bear and Wilson, a bird named Poe, a hedgehog named Hokey Pokey and two cats. Sophia is involved with Odyssey of the Mind and plays the violin. She enjoys reading when she has some free time. Orchestra is her favorite class this year and she feels like Mrs. DeYoung is the best teacher and she is having fun learning to play the violin. Her favorites include the color teal, eating pulled pork, reading the book Edward Tulane and listening to the music of Imagine Dragons. Olivia is a Michigan State Spartan fan and her career plans include becoming a kindergarten teacher. The people she admires the most are her grandparents Carol and Ron because they do a lot of nice things for people. She is most proud of her Odyssey of the Mind team and her dream vacation would be to take a long trip to Disney with all of her family. 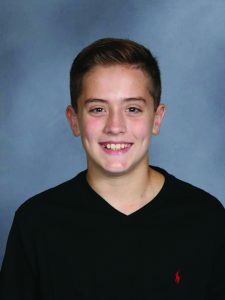 Lucas Poirier, 6th Grade, is in the Structures magnet at ERMS and is an alum of Lakes Elementary School. He is the son of Kristina and Gary Poirier and has two sisters. Sydney who attends East and Olivia who is a second grader at Lakes. His favorite class this year is math with Mr. Ouellette because he is so awesome. His other favorites include: the color dark purple, eating sushi, watching the movie Holes and listening to the music of Imagine Dragons. According to Lucas the best things about East are the concession stand and the French fries from the cafeteria. Lucas is a Notre Dame fan and he would like to become a robotics engineer. His dream vacation would be to travel to Japan. When asked who he admires the most Lucas replied: “Jesus, because he tells me to be a good person and to follow God.” He is most proud of his black belt in karate and his kind heart. 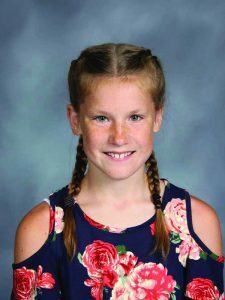 Reagan Korte, 7th Grade, is the daughter of Woody and Stacey Korte. She has three brothers: Evan, Carson and Langston. The family also has three dogs: Toby, Bentley and Harper. She is a Lakes alumnus who enjoys playing water polo, volleyball and doing crafts. 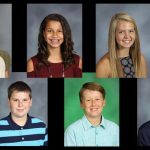 The best things about East, according to Reagan is math class because she enjoys the challenge and the choices of cool electives she has been able to take. Her favorite color is purple and her favorite food is popcorn. She enjoys the Star Wars movies and is a Wolverine fan. Her future plans include becoming a pediatrician and traveling to Hawaii. The person she admires the most is Hailey Nash because she is a very nice person, is smart and fun to be around. Reagan is most proud of her grades. 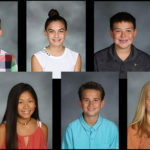 Dylan Bjork, 7th Grade, is the son of Amber and Duane Bjork and has a sister named Abbie and the family is also hosting Mai who is an exchange student. The family pets include: chickens, a dog, a gerbil and fish. Dylan attended Cannonsburg Elementary School. His favorite class this year is Teen Leadership with Mr. Avink. Dylan enjoys the class because of the teacher, Mr. Avink, and the fact that he makes the class fun. In his free time, Dylan plays lacrosse and spends time with his dog. Orange is Dylan’s favorite color and spicy BBQ wings from Buffalo Wild Wings are his favorite food. He enjoys the movie The Blind Side and any of the Avenger movies. Dylan cheers for the Wolverines but would like to attend Davenport University. His dream vacation is to travel to Fiji. The people he admires the most are his lacrosse coaches because they have taught him so much and are great role models. Dylan is most proud of himself for making good choices and being a good role model. Cassidy Bennor, 8th Grade, is the daughter of Jim and Kellie Bennor. Cassidy has seven siblings: Shane, Nick, Jesse, Blake, Dylan, Peggy and Coda. The family also has two cats. 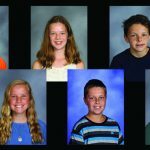 For her elementary school years, Cassidy attended Parkside Elementary School. In her free time, she enjoys playing softball, hunting, fishing and drawing. 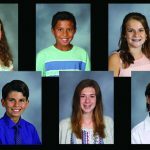 Her favorite class this year is History as she enjoys learning about American History. 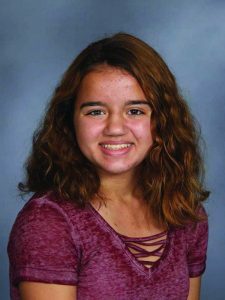 What Cassidy enjoys most about East is all of the elective classes she has been able to take while a student here. Her favorites include: the color teal, eating steak, the Marvel Movies, the book This is Where It Ends and listening to pop music. She is a University of Michigan fan and would someday like to be a crime investigator for the FBI. Her dream vacation would be to travel to Ireland. When asked who she admires the most, Cassidy said her mom “because she never lets anything get her down and she is the strongest person I know.” Cassidy is most proud of the things she has accomplished so far in her life. 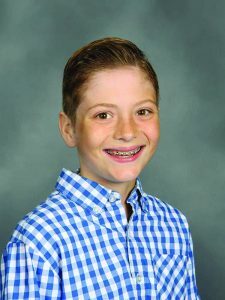 Carter Klein, 8th Grade, is the son of Kelly and Richard Klein. He has two brothers: Justin and Cohen and he attended Lakes Elementary School. 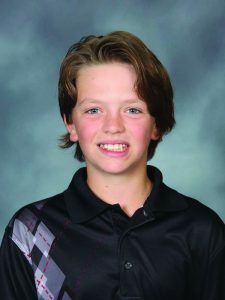 Carter is an avid hockey player and also enjoys reading and traveling in his free time. Carter’s favorite class this year is STEAM because his loves to use technology and to problem solve. According to Carter, the best thing about ERMS is the teachers. His favorites include: the color red, eating filet mignon, and the movie Saving Private Ryan. He enjoys listening to any music put out before 2010 and he is a huge history buff. He would like to attend Boston College and right now he thinks he would like to be a lawyer. His dream vacation is to travel to Germany or France. The people he admires the most are his parents because they are supportive and always want the best for him. He is most proud of his grades and how hard he works to keep up his grades.